Make Feedback Immediate, Public, and Nonjudgmental | Reinvigorate Your Dream! ← Advisor / Evaluator. An ineffective combination. The June 2011 issue of Wired Magazine had a terrific article on the power of feedback loops[i]. 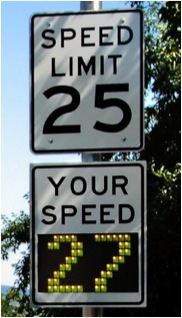 As the key example, the author, Thomas Goetz, pointed to the use of the “Your Speed” signs that have been around since about 2003. These are the signs on roads and highways that tell you how fast you are going. These devices have consistently had a powerful impact on reducing speeds and influencing compliance to posted speed limits – without the resource demands that dishing out citations require. One might expect that after a while (say at least eight years) there might be some tendency for the effectiveness to wane as these devices become more obscure blurring into the background scenery. However, this has not at all been the case. What is going on here that is making these devices sustainably effective? After all, every car has a (presumably functional) speedometer. Why is a sign posted out in the open more effective than our speedometers? Why is the speedometer ineffective as the source of immediate feedback? This leads us to the second part of my hypothesis – public awareness. Unlike speedometers, the “Your Speed” signs remind us that we are not the only ones aware of how fast we are going. It is on display for all to see. And, in harmony with the vast sociological and anthropological research[ii] that provides compelling evidence that we, as social beings, are evolutionarily wired to cooperate, we do not want to be seen as the “bad guy”. We are motivated to self-adjust by slowing down. This might perhaps explain why our speedometers are not as effective because the information is perceived as private and we believe our fellow motorists are unaware of our speed. The third and perhaps most important component of my hypothesis is that the feedback from the “Your Speed” sign is not delivered in a judgmental way nor is it delivered comparatively to the speeds of others. It is merely a report back of what is our current speed compared to the posted speed limit. This is psychologically different from being pulled over because when that happens we are sitting in judgment of another individual and the consequences are completely at their discretion. Police officers are granted a socially recognized status of public authority. That does not diminish the psychological affect of having outcomes consequential to us at the sole discretion of another. Now, let’s draw this out to performance feedback in the workplace. From my experience, performance reviews are a joyous activity for absolutely no one. And, far more often than not, they do little to sustainably improve performance. They merely facilitate the dehumanizing task of ranking people and distributing consequences (raises and promotions or performance notices and warnings). What do the “Your Speed” signs teach us about the power of effective feedback? What if we were to model the performance reporting process with similar properties: 1) the feedback is immediate (not year-end) and the employee is given the opportunity to self-adjust; 2) the feedback is in the public domain (not necessarily advertised but not concealed) so the employee is encouraged to self-adjust; and 3) the feedback is non-judgmental and not in comparison to others. It is only in comparison to the documented objectives. I invite organizations to consider “Your Speed” sign approach to performance management for greater effectiveness and improved performance. Anecdotally, my cynicism leads me slightly to contemplate a municipality’s goal when deploying a speed control strategy. If revenue through citations is prioritized over long-term driver safety, then hide the officer behind the barricade or put up the cameras and have at it. The problem will never go away and neither will the risk of traffic accidents and fatalities. Likewise, if your organization’s goals are to rank and yank employees before they even have the chance to realize their full potential, then stick with the status quo. If, however, you want your organization to be a place where people do grow, develop and prosper, thus growing your business to new levels of posterity, try the “Your Speed” sign. Both evidence and evolutionary science strongly suggest such a paradigm in performance management is far more advantageous in the longer term. [ii] “The Unselfish Gene” by Yochai Benkler. Harvard Business Review, July-August 2011; & “Welcome Stranger” The Economist, July 30th 2011. Thank you for reading! As always comments are welcome. I wish you a pleasant day. This entry was posted in Uncategorized and tagged Business, development, human resources, improve, Leadership, management. Bookmark the permalink. Great post Matt, and covers a topic near and dear to me. We were always taught to criticize in private, praise in public. As I experience this, I am starting to see that this isn’t the best way to correct issues. Addressing the issue, not the person, is the Army way, and doesn’t cut into team momentum. Candid feedback is an act of kindness, not an act of aggression. Thank you for the feedback Robert. Very tricky area for sure. In “Punished by Rewards”, Alfie Kohn even suggests being very careful with any feedback. His position on this can be expressed by the following: “The notable aspect of a positive judgement, is not that it is positive, but rather that it is a judgement.” So, we should always take care as not be come across as judging. I like your comment of addressing the issue, not the person. Be well and have a great day!